I've created four haikus of the patch - one for each season. Although I've adhered to the structure of 5-7-5 syllables, I'm not entirely sure they'd pass muster for the strict haiku purist. 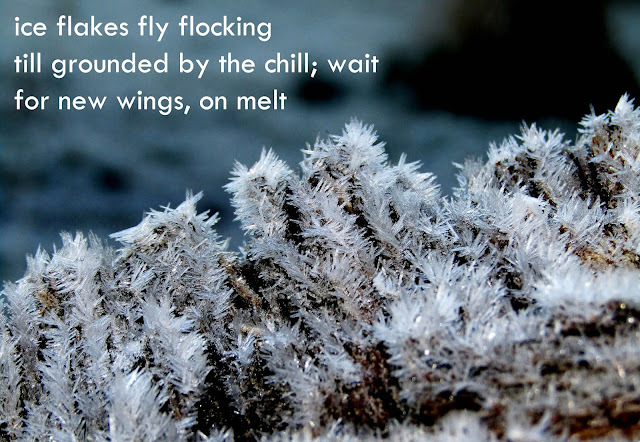 Typically a haiku is an observation involving a fleeting moment in nature. These certainly concern nature, but are more attempts to evoke something about a detail - as depicted in the photo - than just the one moment. Maybe I should describe them as short poems with the structure of a haiku. My favourite kind of nature photo are those that home into to a small detail. I think there's a certain 'haiku-ness' to this kind of photo. After completing these it occurred to me that there are some pleasing parallels between a haiku and this blog itself. The haiku writer is limited by structure of the poem. Similarly, in concentrating on a small area of countryside - the patch - the mind is concentrated in the same way. Everywhere on the patch there is an extruding and issuing. Toadstools are emerging from nooks, crannies and crevices. 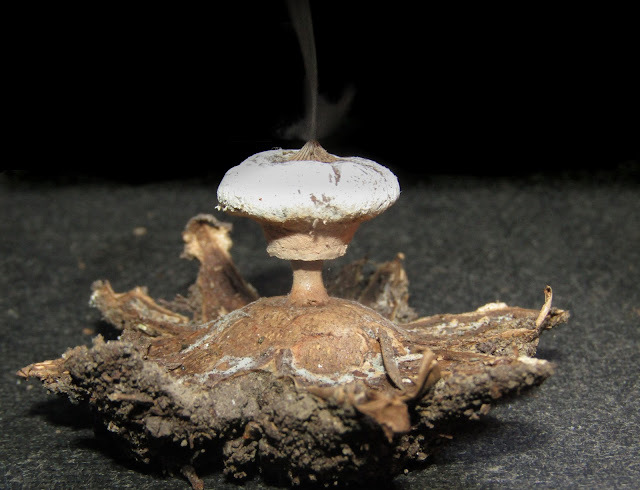 Agarics are bursting from the soil. Brackets are banding tree trunks. Crusts, smuts and mildews are coating branches and leaves. Tripe, jelly, ears and brains are erupting their bizzare shapes from rotting wood. Fashioned, as if from the very stuff of underworld, from the soul of beneath. Aristotle puzzled over the nature fungi, coming to the conclusion that they were an odd kind of plant. On the other hand, a lot of his less scientific contemporaries believed them to be earthly manifestations of a magical realm. It's easy to see why. Their sudden appearance overnight, has something of the conjuring trick about it. Even plants move around, and rustle in the wind. Fungi just stand there - silent and still – mysterious sentinels keeping their fungal secret knowledge to themselves.